For the next five minutes, forget about anything that happens on the court. Just think of each of the 18,624 seats in the TD Garden that have been filled every single game for 4 of the last 5 seasons. It is this reason alone that the "Big Three" are just as much of a marketing presence on the court, than a defensive presence on the court. With the exception of the 2009-2010 season, the Celtics sold to 100% capacity each season since the 2007-2008 season, when Ray Allen and Kevin Garnett came to Boston. For some reason, during the '09-'10 season, the Celtics' average attendance was 455 seats short of selling out every game. Still, at 18,169 fans per game, the effect the Big Three have had on the box office is obvious. 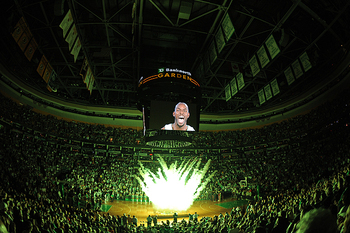 Before their arrival, the Celtics had not sold out a season since the last season in the old Boston Garden, 1994-1995. This drought is something the Celtics would not like to incur again, and the Celtics would be best playing it safe and milking the brand of the Big Three out for everything it is worth. This current version of the Big Three still has the fascination and attention of the region. This has been displayed in ticket sales this season, which was not suppose to turn out the way it did. Earlier in the year, demand was so low that the Celtics were wisely lowering ticket prices via Facebook on certain game days to as low as $24 for box office tickets. As it turned out, the season ended with another 100% capacity, a trend that can only continue with the region in demand for a product that is, well, in demand. Without the Big Three, this would be a challenge. With them - and yes, all of them - the Celtics should enjoy another season of box office success. No doubt it helps the marketing department to have some obvious attractions to help promote ticket sales, but even teams that fail to achieve winning records or don't have stars of their own can find ways to keep their stadiums filled. Jon Spoelstra wrote about his time with the NY Knicks during the 1980's, when Derrick Coleman was their "star." The marketing department sold ticket packages that allowed fans to see the real stars of that era: Jordon, Bird, Magic, etc. and significantly improved their ticket sales. Personally, I believe teams need to improve their fan engagement activities. It's been proven time & again that engaged fans drive revenue growth. The vast majority of teams treat social media as a traditional marketing channel or as an after-thought. The Celtics heritage alone should be enough to keep their arena filled, but the marketing department must find the right way(s) to connect with its entire audience.